Okay, okay! Stop panicking. Sweetness in this Sweet Chilli Chicken (Chicken Vegetable Soup, Sesame Chicken, Butter Chicken & Salted Egg Chicken) is not from sweet chilli sauce or sugar by itself. It is on the other hand from raisins. Just 1/2 a handful or at your pleasure as per your taste. A tiny bit of sweetness will not ruin your health. Moreover, when its from raisins? In fact sweetness from raisins, saltiness from soy sauce and spiciness from red chillies is a merger food Malaysian delightfulness. Yes. It is. Please don't doubt this Malaysian. She knows what she is talking about. Succulent and slightly crispy on the outside chicken, coated in a spicy-sweet-salty thick sauce (Cashew Masala Chicken, Tom Yam Chicken, Ayam Masak Merah & Indian Chicken Curry). 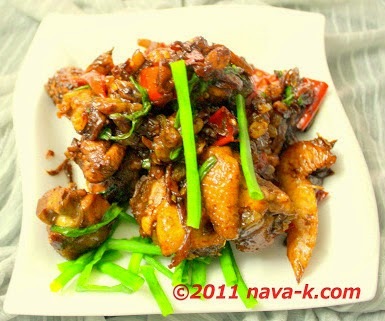 Chinese style of course (Chinese Black Vinegar Chicken). You mean Indians cook this style? I don't know. You tell me please and you make it and pleasure into it. In heated oil, saute chillies, ginger and garlic. Add chicken, stir and pour water (about 1/4 cup). Simmer till chicken becomes tender. Add lime juice, soy sauce, raisins and salt. Stir all together till chicken is coated with a dry thick gravy. Off heat and combine in coriander leaves. This looks very good and I have yet to use raisins in a savory dish, although I have eaten dishes with them in it. I love the idea of this little sweet raisin surprise! Raisins are totally underrated! Great recipe :) Buzzed! Nava - this is delicious! I LOVE raisins in savory dishes! Another winner and a great photo! Yum! I've never tried raisins in my chili chicken! Thank you for all the adorable and wonderful comments everyone, appreciate it very much. This is easy to make and looks delicious. Delicious with a kick to it.